Looking at two common toggle clamp styles demonstrate this 'trick'. I’ve always been fascinated by mechanisms that use some kind of geometric ‘trick’ to accomplish a task. A prime example of such a mechanism are toggle clamps. While there are many designs one can find for toggle clamps, the basic operational principle tends to be the same in most cases. It all starts with the humble pin connection, which prevents movement in the x or y direction, but allows rotation. Since rotation is allowed, no moment can be transmitted around the pin connection. An applied moment would simply cause the part to rotate, rather than transmitting across the link. If a link has pin connections on both ends, an interesting thing happens. Any force at one end that is not directly along the line between pins would cause a moment around the other end. Since neither side can support this moment with reaction forces, the system would be out of equilibrium. Therefore, any two-pin link in equilibrium can only have forces acting upon it that are directly along the line between its two connections. The trick behind a toggle clamp is fairly simple. The structure is made from several two-pin links (usually three, forming a ‘four-bar’ linkage along with the base). 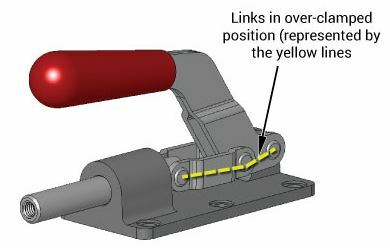 In the clamped position, the links are aligned, such that the clamping force is directed straight along the links, and into a fixed point that will not move. The clamp is locked, for all intents and purposes, unless the fixed point, or some other part of the structure, actually breaks. The other half of the trick is that the handle that clamps and unclamps the toggle clamp is arranged such that the clamping/unclamping motion is directly perpendicular to the clamping force. Since all of the clamping force is directed along the aligned links, nearly no force is required to lock or unlock the clamp in the perpendicular direction. 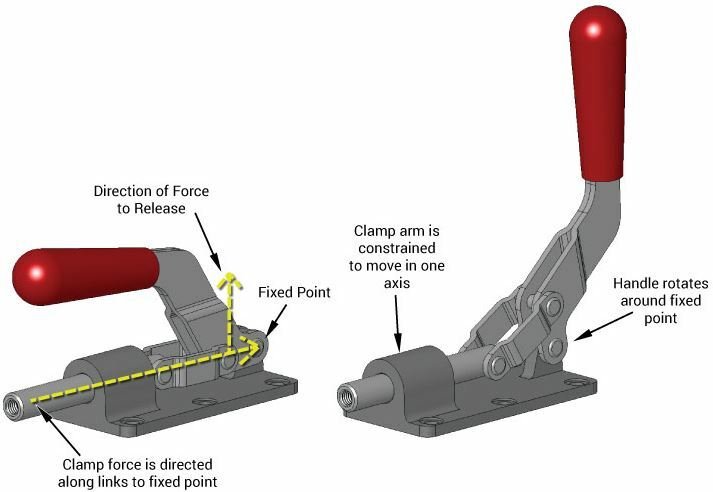 Conversely, because the direction one needs to apply force to release the clamp is perpendicular to the clamping force, no amount of clamping force will release the lock. To illustrate the principal, let’s look at two common arrangements. In this example, the clamping arm is held so that it can slide back and forth in a single axis. The handle pivots around a fixed point, which is part of the base. Finally, there is a link attaching the clamping arm to the handle. As you can see, in the clamped position, the pins in the handle, the connecting link, and the clamp arm all align horizontally. All force from the clamp is directed horizontally along the links to the fixed point. In contrast, the handle is pushed straight down into the clamped position, and pulled straight up out of it. As an aside, this arrangement can easily be modified to lock in both the closed and open position. This is accomplished if the pins in the handle and connecting link are far enough apart to allow the handle to be turned a full half revolution from the clamped position. The links will once again line up along a horizontal line, and resist any force from the clamp arm, in either direction. The release action would again be perpendicular to the clamp force. The only difference would be that the handle would be in tension, rather than compression. All other links would remain in compression. The second arrangement has the clamp arm swinging around a pivot point, rather than sliding in a straight line. Circular motion around a fixed point is always tangential to the curved path. Another way to put this is that it will always be perpendicular to a line drawn to the center of rotation. In the clamped position, the link connecting the handle and clamp arm is held in line with the handle and its fixed point, and perpendicular to the clamp arm. This puts it squarely in line with the clamping force, and, again, the force is directed through the links to the fixed point about which the handle rotates. In an ideal world, that is the end of the story. However, the kind of arrangements that I have discussed are subject to problems in the real world, stemming from issues like vibration or manufacturing tolerances that can allow for less than perfect alignment. If the alignment is not perfect, some portion of the clamping force will go towards releasing the clamp, which can lead to failure of the system. This system is quite susceptible to such an event, as the clamping force is generally high, whereas the release force is quite low, by design. Even if a small fraction of the clamping force goes towards releasing the lock, release can happen quite easily. Therefore, toggle clamps are often designed to ‘over-clamp’ slightly. All that means is that the locking position is beyond the ideal locking position, as shown below. In the example (right), the amount of over-clamp would be limited by the base plate of the clamp, limiting the amount that the clamp could move from ideal alignment in the clamped position. This gives both a bit of leeway for motion from vibration, or some other source, before the lock disengages. It also biases motion. The clamping force will tend to press the linkage further into over-clamp, and into the hard stop, making it even harder for vibration to loosen the lock. 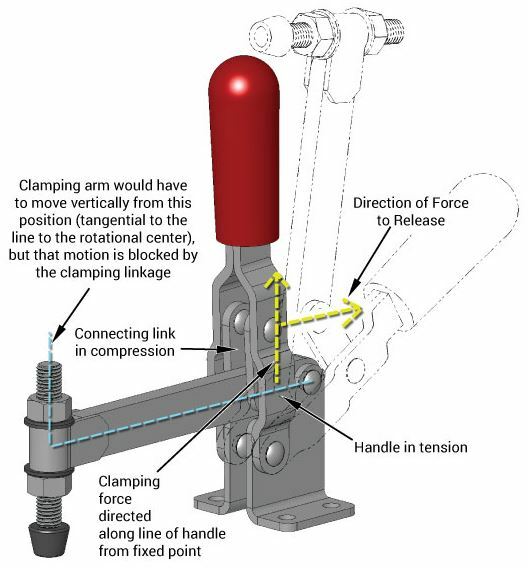 Because the over-clamp is limited, and the final configuration is near ideal, nearly all of the clamping force will still be directed as before, along the links and into the fixed point. I hope this has served as a useful and interesting introduction or refresher into the world of toggle clamps. What is your favorite mechanism that uses some kind of geometric ‘trick’? The Engineering of DEATH. How the Nazis killed on an industrial scale.